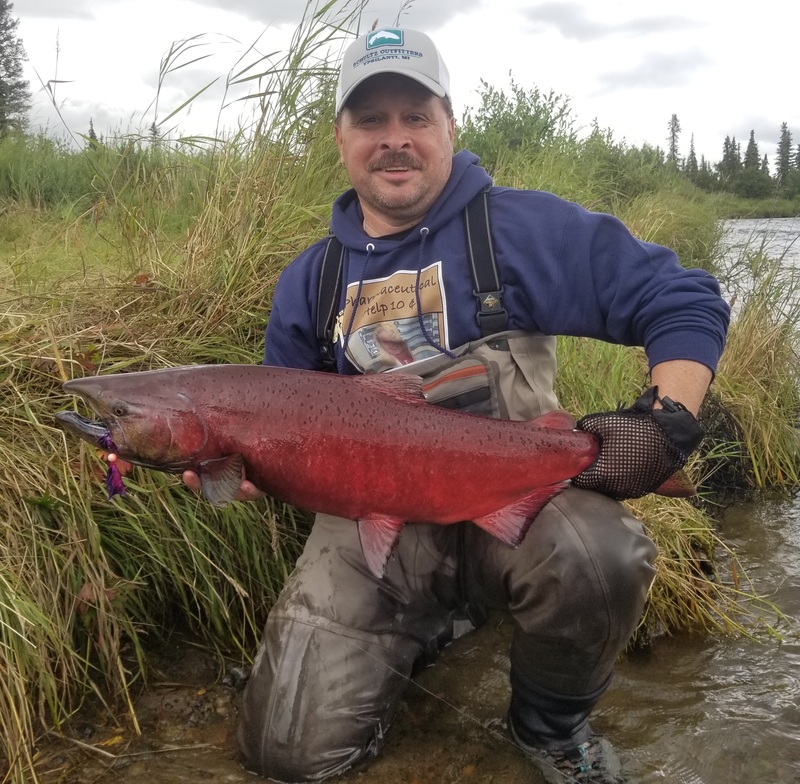 Normally the Sockeye run is over at this time of the year. Fortunately for me a fresh push of fish came in the weekend we arrived. This would give me a short window of opportunity to put some fish in the freezer. With that in mind we piled into the boat and headed to The Black Hole (love the names they give these fishing spots). I figured fishing for Sockeye salmon would be just like fishing for anything else. Drift a fly into a hole, strip it in and hang on. Not quite. Sockeye are continuously moving upstream at about 2 mph until they hit their spawning grounds. During this time they don’t feed on anything. Our guide Tim then explained to me how we were going to fish for them……flossing. I’ve known about this method and have never done it. Basically you are trying to bring the line through the mouth of the fish and then hook him in the corner of the mouth. Totally legal but back here in Michigan it is a method that is hotly debated. Once we got set up I took a position at the head of the hole and started casting. 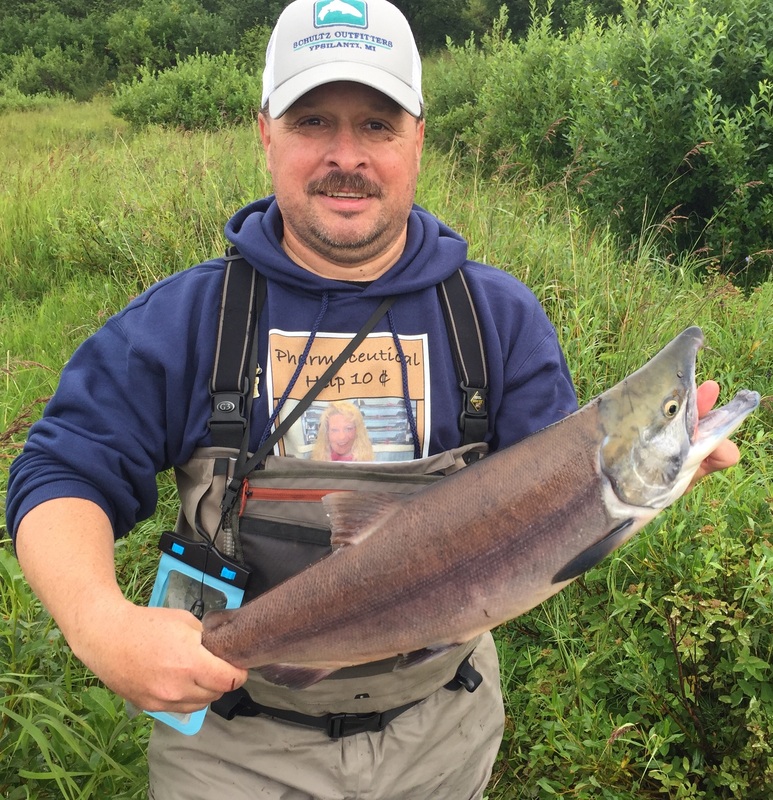 It took a few minutes but soon I was hooked up with my first Sockeye Salmon. After that the fish came pretty quickly. Unfortunately on my second fish I broke my Orvis Helios 2 rod in the first section while fighting a fish. I brought a spare (Scott Flex 8wt) but I was still pissed that it broke. As it would turn out I would really put the Scott Flex to the test. It ended up being my mainstay for the rest of the trip. I also discovered just how important these fish are to the food chain. My third fish had a scar on it from a seal. Tim told me that about 1 out of every 10 fish will have a scar from a seal attack on it. I ended up catching 5 with scars. These fish we had to let go because the bacteria in the scar ruins the meat. Because of this it took me a awhile to get my 5 fish limit. Once I did though I told Tim that John could have my spot. He was fishing downstream and wasn’t hooking into much of anything. He wanted to take some fish home as well and I was glad to help him out. My elbow and wrists were already getting sore so I needed to take a short break. Once John got his 5 we packed it in. Between the 3 of us we ended up keeping 13 fish. Plenty for John and I, Phil didn’t want to take any fish home. All that was left for this spot was to take a couple of more pics. 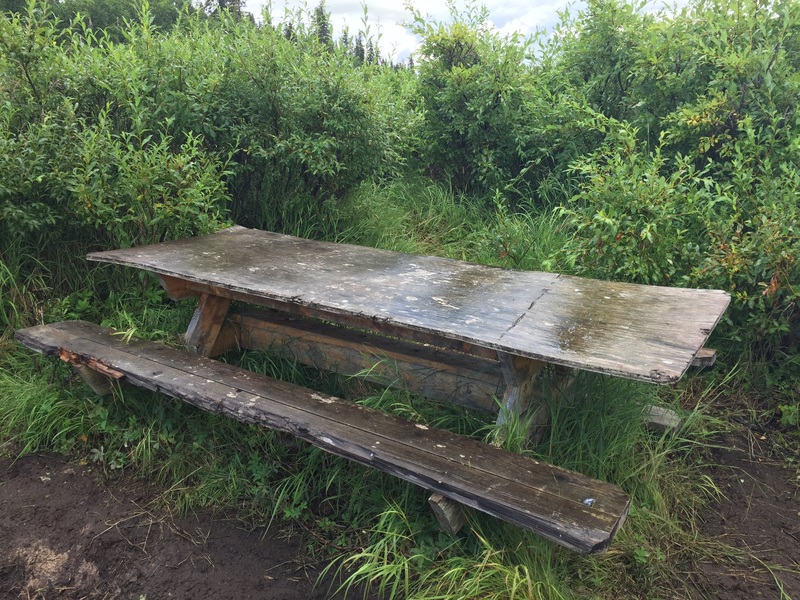 This is the picnic table that they use whenever a client wants to have a shore lunch. Nothing big about a table except that earlier Tim was standing where I took this picture. He looked up and there was a bear standing on the other side with one paw on the table. He yelled and the bear ambled off. Of course I had to go take a picture of the tracks. From there we headed further upstream to a spot called The Confluence. This is where the Nonvianuk and Kukaklek rivers merge to form the Alagnak River. John and Phil would be fishing an eddy where the two rivers merged. 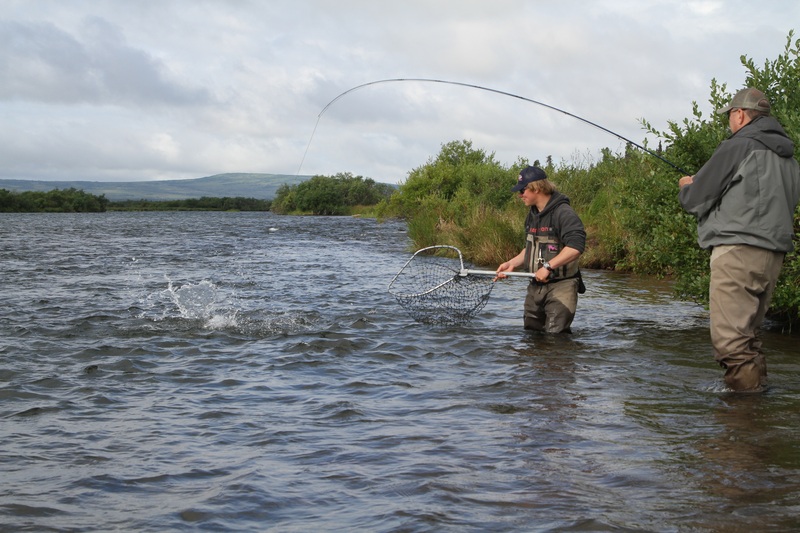 Tim told me to take my Redington Chromer 7 wt switch rod and head upstream a bit and fish the Novianuk. 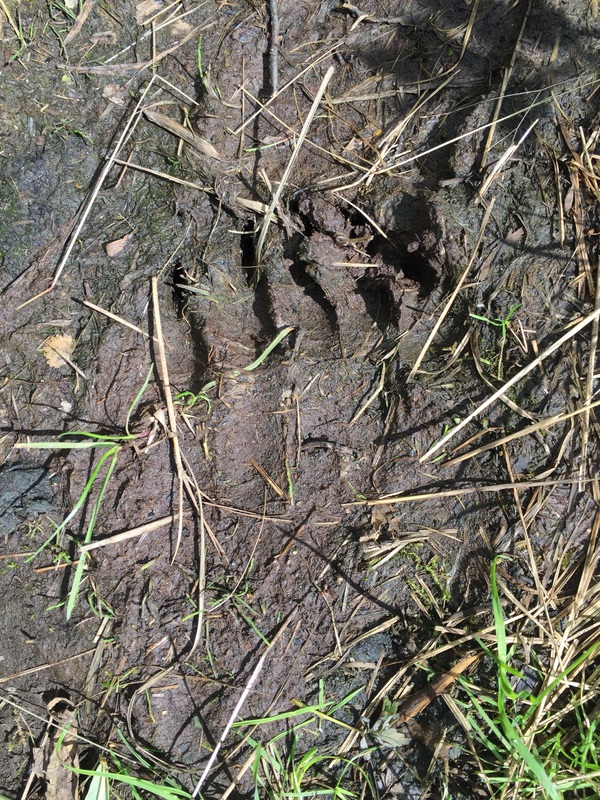 I made lots of noise as I walked through the grass and waded out to my starting point. The current was wicked fast and keeping my footing was problematic. I started casting though and worked my way downstream. Tim told me to take two steps down after every cast which I did. At this rate I figured I would be done with this run in about 10 minutes. This was the first time I had cast this rod and line combo since June so I was trying to test it’s true potential. So far so good, even Tim commented on how well it seemed to cast. As I worked my way down I was getting closer to Phil. I figured that after a few more casts my fly would be ending up right near him and I was starting to debate my WHAM!!!!!! Just that quick it happened. Here I was planning my next move when a train swam up and slammed my fly and took off downstream. I didn’t know what type of fish it was, all I knew was that he wasn’t going to stick around to let me find out. I yelled out and just about that time he jumped and we all could see it was a King Salmon. Things got very serious after that. 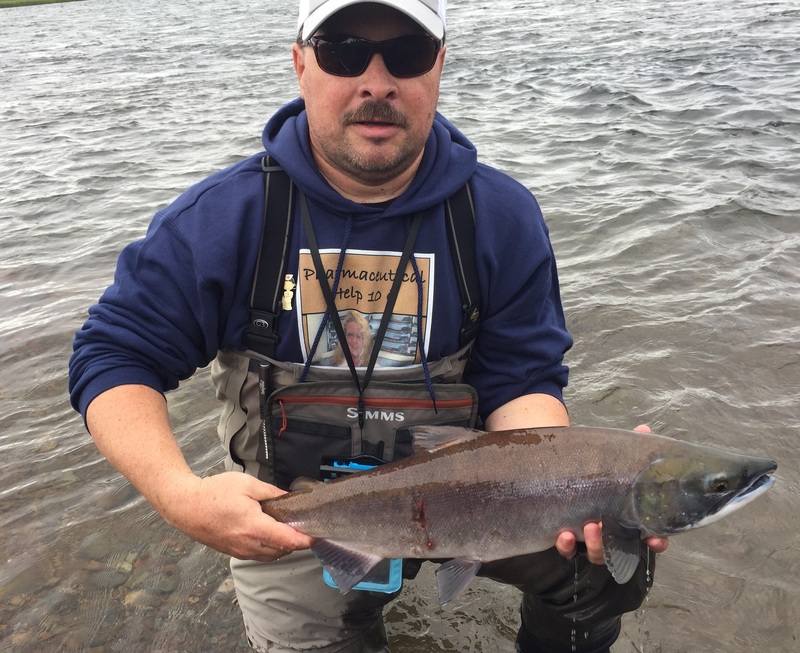 Catching a King on the swing is like the crown jewel of fly fishing in Alaska. Phil got out of the water. John got out his GoPro and started filming. Tim started giving me instructions and all I did was pray I wouldn’t fall over in the current. I was finally able to work my way to some slack water where I could plant my feet and dig in. Now began the see saw battle between me and the fish. I would reel my line in to where I could see the leader and then he would take off again. Back and forth we did this for what seemed like an eternity. On several occasions Tim would go to net him and he would just take off. Tim told me the longer we take the more likely the hook would work free. That wasn’t helping my anxiety at all. I kept the pressure on though and after 25 minutes we were finally able to get him into the net. We kept him in the water while we got cameras ready. The numbers of these fish are extremely low and we were doing everything we could to return him unharmed. The return this year was estimated to be between 45,000 and 65,000. To put it in perspective the Sockeye run was numbered in the millions. Once I was ready we did a quick “grip n grin” and sent him on his way. After that I was done. I was hoping to catch all 5 Pacific salmon species and I just got the hard one out of the way. All that was left now was a Silver Salmon and my chance at one of those would come tomorrow.